Sneakers are the most comfortable and affordable option for daily chores. Put your price woes behind you. Flipkart.com brings you Globalite Stumble Sneakers at Lowest Price. These casual shoes have panel and stitch detail that makes them comfortable. The wine colored canvas fabric and PU sole material give a great cushion to your feet. Amazing, comfortable and great priced, the Globalite Stumble Sneakers make it a must-buy. 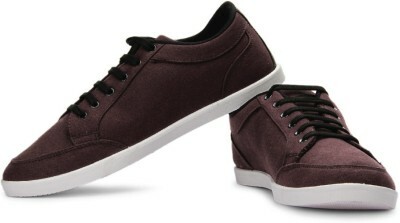 Laced and round tip shape, you can match these sneakers with your jeans and shorts. With rich wine color after all you can make your feet do the talking. How to get this Flipkart Globalite Stumble Sneakers at discounted price of Rs 499? Make a quiet advance in your career with the Globalite Stumble Sneakers at Lowest Price Of Rs 499 from Flipkart.